The 2016 Electoral College Map, showing Maine’s one electoral vote for Donald Trump and three for Hillary Clinton. Image courtesy Wikimedia Commons. AUGUSTA – In an attempt to circumvent the electoral college, a group of liberal lawmakers, led by Rep. Deane Rykerson (D-Kittery), are sponsoring a bill (L.D. 418) that would enter an agreement with other states to give away Maine’s four electoral college votes to the candidate that wins the most votes across the other 49 states, plus Maine. 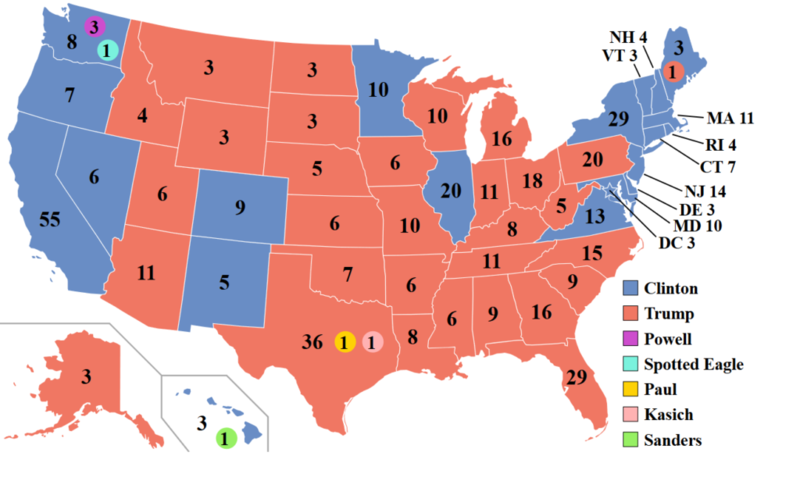 The National Popular Vote Interstate Compact, as it is called, has become law in 12 “states” that control a total of 170 electoral college votes so far, according to the website of the group pushing the issue nationally. The proposal would mathematically reduce the strength of Maine’s vote in the Presidential election by around 20 percent if calculated based upon the 2018 results. Under the electoral college, Maine’s four electoral college votes out of the total 538 electoral college votes in the nation equal about 7/10 of one percent of the overall vote. But in 2016, Maine’s actual vote total as a percentage of the national vote total was closer to 5/10 of one percent. Opponents of the national popular vote effort point out that small states benefit from the electoral college by requiring Presidential candidates to travel across many states, learning about and addressing the concerns of a diverse cross section of Americans. They say a switch to the national popular vote would encourage Presidential candidates to camp out in the larger states, such as California and New York, which produce tens of millions of votes in a Presidential election, instead of smaller states which might produce only 250,000 to 750,000. The proposal that will go before the Maine Legislature is curious in that it sets up a scenario where a candidate could win only a few states, but with large enough margins of victory in the popular vote that they won the national popular vote, thereby forcing a majority of states that voted against that candidate to award them the electoral votes they need to become President. Advocates for national popular vote argue that it is a more direct democratic method of electing the President. Opponents of Maine joining the interstate compact argue that Maine’s law allowing the state to split our electoral votes by Congressional District strikes a health balance by being more representative of the state’s votes, but not giving away our electoral college votes to the other states. You can read the full proposal that will be considered by the Maine Legislature by clicking here. Other sponsors of this bill are: Rep. Kent Ackley; Rep. Pinny Beebe-Center; Sen. Justin Chenette; Rep. Lori Gramlich; Rep. Nicole Grohoski; Sen. David Miramant; Rep. William Pluecker; Rep. Stanley Zeigler. The national popular vote movement was started by John Koza, who runs the National Popular Vote non-profit currently pushing the legislation that will be considered in Maine. Koza’s claim to fame, aside from the national popular vote movement, is being co-inventor of the rub-off instant lottery tickets used in state lotteries around the country. In the previous Maine Legislature, a similar proposal was defeated in the Maine Senate with several Democrats joining Republicans to vote down the bill.